Hi Guys just wondering if you guys might be able to help me out with this one.I like to buy some history items that have stories to them, i own a few items in releation to the HOOD and also planes but ive never owned a WW2 medal. Bought a set of Medals the other day and just trying to find more info on who they were awarded to and to check out the service history. They were awarded to someone in the Royal Navy Volunteer Reserves and He was a LT, Did ask for the service number and according to who i bought it from RNVR didn't have service numbers till after WW2. Also only have the initials which is D E Stone. Searched it on the National Archives and found nothing. Also searched it on Forces War Records and did find a D E Stone but they were in the RAF based at RAF Skellingthorpe, i found a Donald Edward Stone in the Royal Air Force Volunteer Reserves but this box was clearly marked RNVR. Just wanting to find out more info as if the story was true about the ship he served on i have a great idea for a model tribute. According to the seller he served on board HMS Braithwaite throughout her career but im wondering if there's even just one crew list so i can just have a read over it. There was no items in with the medals from Braithwaite and when i asked the seller how he managed to research that so i can look into it further i've have no replies since. I have a feeling it is the Donald Edward Stone listed again the RAFVR as when doing reseach i found this. So it could explain that maybe he was in the RNVR but was part of the air branch so in my quick research and was then listed against the RAFVR incorrectly and never did serve on Braithwaite? 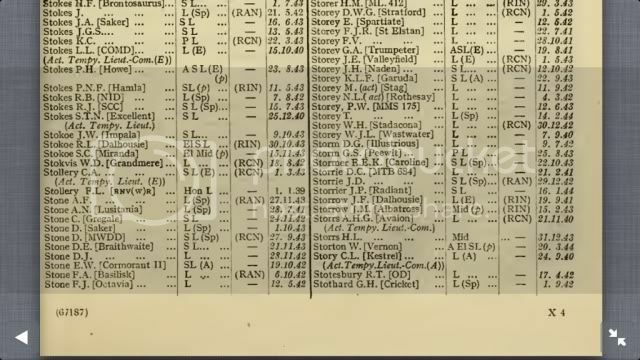 I think you are following the wrong officer trail.... the mid-1945 Navy List (only WW2 one I have) shows a Douglas Edward Stone as being a Sub-Lieutenant RNVR; seniority 21 November 1943; no appointment in 1945. The only other info on him was that he was a qualified watchkeeping officer. He was not aircrew. . .. There are no such things as 'crew lists'. The Navy List (produced at six month intervals during WW2) lists all commissioned officers and where they are serving - I have to say that in the May 1945 edition (the only one i have from ww2) does not show Stone onboard the Braithwaite. Thanks for that I was kind of hoping I might have been on the wrong trail with it. How would I go about possibly accessing these navy lists? Did find the site you mentioned and noticed he wasn't listed so fired off an email last night. I take it on your list he's not stationed anywhere? Or where he lived?